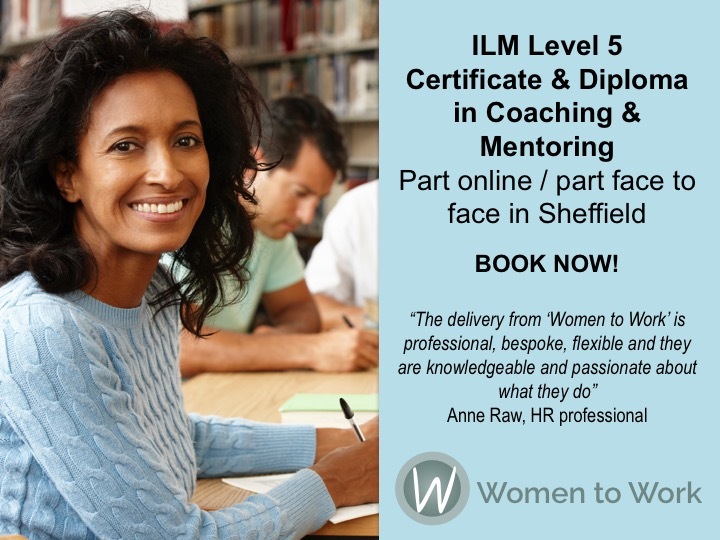 Women to Work is delighted to be continuing to offer the ILM Level 5 Certificate & Diploma in Coaching & Mentoring* in Sheffield. This programme is ideal for individuals who wish to take a qualification independently, for individuals working within an organisation or for an organisation looking to run an in-house coaching and mentoring training programme. An individual wishing to train to be a coach or mentor? A manager using a coaching and mentoring approach with your team? An internal coach or mentor or someone with coaching and mentoring responsibilities as part of your role? The programme has been designed to be delivered part online and part face-to-face over an 18-month to 3-year duration. In addition, all delegates will receive dedicated one to one telephone tutorial sessions, full workbooks and reading lists to support learning. With a greater emphasis on online learning, much of our programme can be done in your own time around your work and family commitments giving you the flexibility to learn at your own pace in your own way. Studying for the Certificate costs £1,950 and the Diploma is £2,495 and places are available to book for a start date of your choice. For further information on what the course offers please click here or contact us to find out more or to book your place. For organisations wishing to book multiple places, to run an in-house or full face to face workshop version of the programme or organisations interested in ILM Level 3 Coaching and Mentoring qualifications please get in touch.